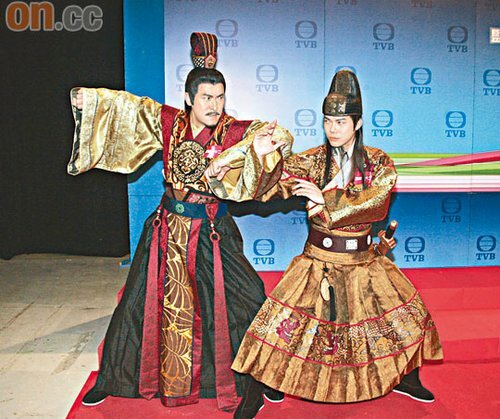 The costume fitting for TVB’s new ancient series, “Hong Wu Thirty-Two” ( 洪武三十二). The series stars Michael Tse Tin Wah, Joe Ma Tak Chung, Kate Tsui Tsi San, Sammul Chan Kin Fung, Elanne Kong Yeuk Lam, and Benjamin Yuen Wai Ho. Acting in an ancient series for the first time, Elanne Kong will play a princess. “At first, I was concerned that my features are too modern to fit the role. But after the costume fitting, the results were okay.” She will be involved romantically with Sammul, Michael, and Benjamin. Elanne anticipates partnering with Michael, but she is afraid that she will be unable to contain her laughter. Jayne: Can’t believe Sammul’s comment regarding Stephen Chan; he sounded clueless. Didn’t he read the newspapers? I actually agree with Samuel. Stephen Chan should not be in this news with the costume fitting press conference. Hes avoiding it because he has a grudged against him and so does other actors and actress.